Despite the fact that advertisers have been trying to convince us the holiday season starts the day after Halloween, the holiday season is officially upon us today with the arrival of Thanksgiving here in the United States. CTN savors the holiday season, embracing all the tradition that goes along with this special time on the calendar. After all, tradition is the bedrock of much that CTN holds dear. So, CTN also will adhere to tradition today, revisiting the Thanksgiving-themed column that appeared for the first time last year. Similar columns celebrating the arrival of Christmas and New Year’s will appear at the appropriate times. But the present is all about celebrating our blessings with family and friends. And we all personally have much to be thankful for this week as we celebrate the biggest food-centric holiday out there. The global hockey community also has many reasons to give thanks as Christmas prepares to round into view in the coming days. Below is a list of all that CTN is thankful for this year. CTN also would love to hear what the readers are thankful for, hockey-wise. Send your lists to roarkeblog@nhl.com, and CTN will publish the best ones in next week’s Penalty Box. * First and foremost, CTN is thankful for a happy and healthy family to share the dinner table with this afternoon. Family makes everything else – including hockey – all the more sweet. * The exciting rookie class – headed by Patrick Kane, Jack Johnson, Erik Johnson and Sam Gagner – that has flooded the NHL with new talent this fall is another reason to be thankful, for sure. * CTN is most grateful for the additions to the NHL.com family that have taken place, making hockey’s best Web site even better. * Who isn’t thankful for the advent of Center Ice and Center Ice Online? Other than Mrs. CTN, that is. * The NHL Network is another fine addition to the array of choices available to satiate the hockey jones from which we all suffer to some degree. Can CTN get an amen! * CTN is grateful for the addition of the Prudential Center in Newark, the new home of the New Jersey Devils. It is among the nicest barns in North America and will make a great home away from home for CTN. * Thanks should be offered that the NHL All-Star Game will be in Atlanta this year. On a personal note, it is one of the few NHL cities that CTN has yet to visit in the course of his duties. On a broader note, it is about time Atlanta gets the chance to shine on the international hockey stage. * For many in Canada, the Worlds Junior Championships are a version of Thanksgiving – an excuse for families to get together and enjoy some good food and good friends while watching great hockey. For CTN, the WJC is simply the best of all the international tournaments. * CTN is eternally grateful to NHL Central Scouting, which does yeoman-like work in detailing the strengths and weaknesses of each member of each draft class, providing fans with constant fodder for the upcoming draft. 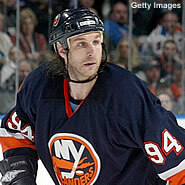 Ryan Smyth was the biggest name to move at the Trade Deadline last year. * Trade deadline day remains one of the most exciting 24 hours on the hockey calendar. Who among us will not sing its praises? * CTN remains convinced hockey players are the classiest athletes on the sporting landscape. For someone that makes a living dealing with athletes, that fact is a godsend. * Junior hockey continues to grow in the United States, particularly in the New Jersey area that CTN calls home. Thanks must be extended to all that have made this happen – the players, the coaches, the administrators and the parents. * CTN also is thankful that the NHL has scheduled a few games for Thanksgiving night. The four games on the schedule should be just the ticket to cap a day filled with high-school football in the morning, pro football in the afternoon and food and family throughout. You know what they say about saving the best for last, right? * The Stanley Cup Playoffs is the most special and difficult tournament known to mankind. CTN is so very thankful that the two-month test of hockey greatness has not – and will not – lose its luster or meaning. * Most importantly, CTN is thankful for the passionate fans that make the game of hockey so special. And a special shout out to the loyal readers of Crashing The Net. You are a special breed which keeps CTN eager and driven to provide the best hockey content available anywhere. Thank you to each and every one of you for all that you bring to the global hockey community. Enjoy the turkey today and be safe throughout this holiday season.